The region of Blagoevgrad is set against a majestic, mountainous background; some of its peaks are among the highest points in the Balkans. Blagoevgrad has many protected national parks and nature reserves. The Pirin National Park, a beautiful Alpine landscape in between two river valleys, is the most renowned of these. The province's population mostly lives in the Struma and Mesta river valleys. 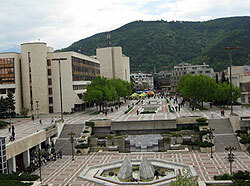 Blagoevgrad’s major town is Blagoevgrad City. Other important towns include Bansko, Gotse, Delchev, Melnik, Petrich, Razlog, Sandanski, and Simitli. The region shares borders with Greece and the Republic of Macedonia, and the province’s economy is bolstered by many Greek visitors seeking its cheap goods and services. Almost half of Bulgaria’s famous mineral springs are located here, and Blagoevgrad’s tourism industry is also boosted by skiers, ecotourists, and those exploring the remains of ancient civilizations. History enthusiasts will love Blagoevgrad for its Thracian mounds and settlements and for the unique architecture designed by the masters of the National Revival period in the villages of Kovachevitza, Pletena, Dolen and in the towns of Bansko and Melnik. With its long ski season (mid-December until mid-May), Alpine slopes and excellent ski and visitor facilities, Bansko is Bulgaria’s top ski and snowboard destination. 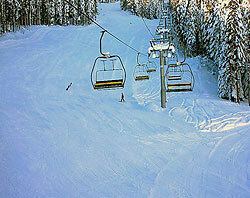 Situated in the glorious mountains of Pirin, Bansko is bordered by the natural beauty of Pirin National Park. Bansko has luxury hotels, busy pubs, popular restaurants that serve local and international cuisines, and holiday and residential apartments mingling with historic sites. Some of the oldest of these are the fortresses of Staroto Gradishte and the even more ancient burial mounds nearby. Bansko also holds an annual Jazz Festival, which draws many tourists from all over the world. Melnik is an ecotourism and cultural tourism hub and an important wine producer. Despite being a very small town, it is one of the most culturally significant. 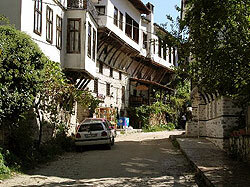 Melnik’s allure stems from its Ottoman and medieval architectural landmarks. Important structures include the nearby Rozhen Monastery, the 13th century fortress called the Byzantine House, the preserved homes of wealthy merchants and figures in regional history like the Kordopulov House, Pashov House, and Pasha’s House, the medieval church of St Nicholas, and the centuries-old churches of Sts Peter and Paul, St Nicholas the Thaumaturge, and St Anthony. Perhaps the most amazing sights in Melnik, however, are natural and not man-made: large, jagged “sand pyramids” that rise out of the sides of the canyon that the town is nestled in. Aside from its wealth of architectural attractions, Melnik has been producing wine since 1346. Melnik’s strong wines were reputedly among Winston Churchill’s favourites. The capital of the Blagoevgrad region is also the administrative, cultural, and industrial heart of the Bulgarian southwest. The city has natural reserves of pure mineral water and, as it is situated in the foothills of the Pirin and Rila mountains, is surrounded by mountain forests. Restoration work in the city’s old quarter, Varosha, began in the 1980s, and now many of the homes in the area have been converted into galleries and workshops, though some are still used as residences. 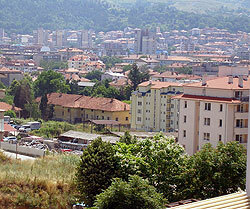 Blagoevgrad is also a college town. The student populations of the Southwest University and the American University help liven up the city and give it a youthful atmosphere.